One of the greatest event of Samsung is the release of Samsung Galaxy A5(SM-A500) in November, 2014, and Samsung fans can't wait for experiencing the stylish metal coating since most of them aren't satisfied with the former plastic body coating in a long time. However, metal coating will be the main feature of upcoming Samsung Galaxy A-series Android smartphones including Galaxy A3, Galaxy A5 and Galaxy A7. It is rumored that Galaxy A5 will offer a 5-inch display with 720 x 1280 pixels resolution and it owns 5MP front facing camera and 13MP rear facing camera with LED flashlight. Because its market positioning is lower than Galaxy Alpha, Galaxy A5 is cancelled the function of fingerprint identifying, waterproof, dustproof and heart rate sensor. But it will still keep the super power-saving option from Samsung Galaxy S5. Certainly, the running system on Samsung Galaxy A5 is Android 4.4.4 Kitkat. Furthermore, about the supported video/audio formats, some fans pose a question: whether we still need to find a solid Samsung Galaxy A5 Video Converter to finish MKV AVI video conversion task for playing any videos even including YouTube videos? Why the Reliable Video Converter for Galaxy A5 is Still in Urgent Need? 1. 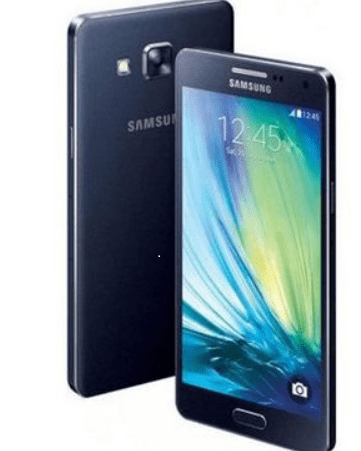 Supported video/audio formats for Samsung Galaxy A5 is also in a small scale. According to the Samsung Galaxy supported formats, it's not hard to see that Galaxy A5 has a huge possibility to only support the above-mentioned video and audio formats. But, sometimes, video filename extensions like .avi, .flv, .mkv, etc also can't be played normally as for the different component of videos, such as codes, resolutions, frame rate, bite rate and more. What's more, Galaxy A5 users also will face the problem of how to naturally play HD videos including AVCHD Video, MPEG-4 TS HD Video, WMV HD Video, etc. Thus, as Galaxy A5 fans, you should start seeking for suitable Samsung Galaxy A5 video converter with the approaching of release date. 2. People's need of fluently watching videos on YouTube. Nowadays, a majority of people adopt the way of watching online YouTube videos on mobile devices for convenience by connecting wireless network. But, commonly, in the public places, you can't watch online videos YouTube videos fluently because many people are sharing the same network with you. Finally, the video playing dialog-box endlessly reminds you of buffering. Desperately, you regret that haven't downloaded YouTube videos to gadgets like Galaxy A5 in advance with the aid of YouTube to Galaxy A5 video converter. Samsung Galaxy A5 Video Converter Easily Solves All Kinds of Video/Audio Incompatible Problems! When figuring out the proper video converter for Samsung Galaxy A5, the most important factor is judging whether the input and output formats are enough to satisfy your conversion needs. 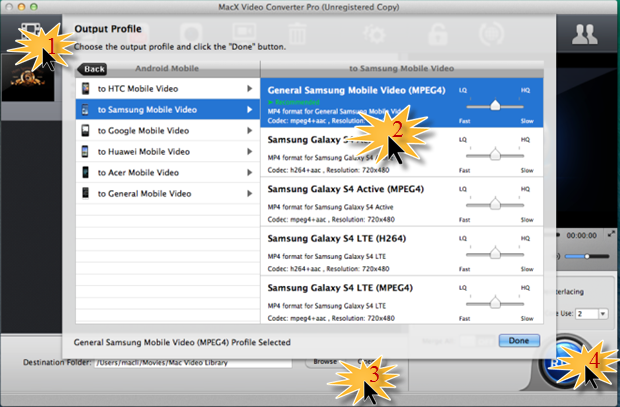 Designed for this purpose, MacX Video Converter Pro is an outstanding Galaxy A5 video converter among countless video converting software on the market. Not just because it enables you to easily convert any video including YouTube videos to over 180 video formats and 14 popular audio formats on Mac OS (Yosemite included), such as M2TS to MP4, AVI to FLV, AVCHD to MP4 and more, but also as for it is capable of directly converting any video to mobile devices to resolve all video incompatibility issues for Samsung Galaxy A5, Samsung Galaxy S5 mini/S5, Galaxy Note 4/Edge, Samsung Galaxy Tab S, iPhone 6/6 Plus, iPad Air 2, iPad Mini 3, Surface Pro3, etc. Of course, high quality video output and 83X faster speed become other indispensable factors for confirming your decision again. Tips: Before you begin to convert MKV AVI FLV to Galaxy A5, you should download and install this Mac video converter on your Mac computer. If you are a Windows user, feel free to download the Windows version of video converter. Step 1: Run the Galaxy A5 video converter and then click "Add Files" to load the video you want to convert. Step 2: Choose a video format for Galaxy A5 from the drop-down list, like MP4, AVI, or M4V. Or you may just choose the device in "to Samsung Mobile Video" directly. Step 4: Click "RUN" button to start converting video to Galaxy A5. By the way, this Samsung Galaxy A5 video converter also provides the best solution to download and convert YouTube videos to Galaxy A5 so that you can enjoy any videos from YouTube offline on the move.